Dr Barber is Assistant Professor in the Department of Family Medicine at Queen’s University in Kingston, Ont. Dr Williamson is Assistant Professor in the Department of Community Health Sciences at the University of Calgary in Alberta. Ms Biro is Foundational Standard Specialist at Kingston, Frontenac, Lennox and Addington Public Health Unit in Kingston. Dr Hall Barber is Assistant Professor in the Department of Family Medicine at Queen’s University. Ms Martin is Manager of Quality Improvement Strategies and Quality Improvement Plans at Health Quality Ontario. Mr Kinsella is Data Manager for the Canadian Primary Care Sentinel Surveillance Network project at Queen’s University. Ms Morkem is Research Associate and Privacy Officer for the Canadian Primary Care Sentinel Surveillance Network project. Objective To evaluate the transformation in smoking status documentation after implementing a standardized intake tool as part of a primary care smoking cessation program. Design A before-and-after evaluation of smoking status documentation was conducted following implementation of a smoking assessment tool. To evaluate the effect of the intervention, the Canadian Primary Care Sentinel Surveillance Network was used to extract aggregate smoking data on the study cohort. Setting Academic primary care clinic in Kingston, Ont. Participants A total of 7312 primary care patients. Interventions As the first phase in a primary care smoking cessation program, a standardized intake tool was developed as part of a vital signs screening process. Main outcome measures Documented smoking status of patients before implementation of the intake tool and documented smoking status of patients in the 6 months after its implementation. Results Following the implementation of the standardized intake tool, there was a 55% (P < .001; 95% CI 0.53 to 0.56) increase in the proportion of patients with a completed smoking status; more than 1100 former smokers were identified and the documented smoking rate in this cohort increased from 4.4% to 16.2%. Conclusion This study shows that the implementation of an intake tool, integrated into existing clinical operational structures, is an effective way to standardize clinical documentation and promotes the optimization of electronic medical records. Over the past decade there has been a shift toward collaborative patient-centred care, which means health care professionals working together and with their patients.1 Documentation in the medical record is an important part of providing this comprehensive care because it facilitates the communication of pertinent information among health care providers.2,3 The increasing use of electronic medical records (EMRs) for both administrative and clinical tasks has considerable implications for patient safety and quality of care.4 Unfortunately there is often wide variability in data content and a high level of missing data, and this issue can be acute when multisite research and quality improvement activities are dependent on data elements with low reliability. Incorporating an efficient and feasible process to improve the accuracy, consistency, and reliability of data entered into an EMR is essential for ensuring information fields are accurate and up to date. Data on risk factors are often recorded in noncoded and free-text fields within an EMR.11 This limits the usability of these data to estimate risk factor prevalence within a practice or initiate targeted interventions.12–14 While CPCSSN extracts and transforms any smoking data entered into an EMR, the best way to increase data quality is to improve data collection by developing standardized input procedures and processes.14 This article reports on a project to standardize data entry procedures for smoking in a structured text field within the EMR. Owing to its expertise in extracting and optimizing aggregate data within an EMR, CPCSSN was used to evaluate this data quality initiative. The objective was to use CPCSSN to compare smoking status data before and after the implementation of a clinic intake tool designed to improve data consistency and completeness. Data were examined from one academic primary care clinic that contributes EMR data to CPCSSN. Comprising family physicians, nurses, nurse practitioners, dietitians, pharmacists, social workers, receptionists, and referral clerks, this academic family health team (FHT) was an ideal setting for evaluating the usefulness of a smoking intake tool for clinicians and researchers because it was in the beginning phase of implementing the Ottawa Model for Smoking Cessation (OMSC) in primary care (www.ottawamodel.ca). During the first phase of this model’s implementation, a tool was introduced to assess smoking status as part of a vital signs screening process.15,16 Among other clinical and demographic variables, any structured smoking status data, before and after the implementation of the model, were extracted into CPCSSN and cleansed, and subsequently populated the CPCSSN risk factor table. The data were transformed by CPCSSN into a common database schema to form a rich longitudinal database that facilitated a straightforward evaluation of the aggregate data. The smoking data elements included in the intake tool were provided by the OMSC program. A team, consisting of a primary care physician and a clinic manager, designed the intake tool to work within the framework of the EMR and minimize the effect on the clinic work flow (Figure 1). Although it was not mandatory for clinic personnel to use this tool, it was designed with front-line input to be a convenient and easy way for staff to enter risk factor data. After clinic staff members were trained to use the intake tool, it was integrated into clinic operations on September 30, 2011, and was filled out at the beginning of each patient encounter. The form automatically connects to related fields in the EMR to populate and update EMR data. This study used a within-person comparison to evaluate the effectiveness of modifying intake procedures to include a smoking screening tool. Any patients who had an encounter with the practice between September 30, 2011, and March 31, 2012 (the 6 months immediately following the implementation of the tool) and had also had an encounter with the practice before September 30, 2011, were eligible for inclusion in the study. The primary outcome measure was the proportion of participants who had an observation within the CPCSSN risk factor table (which is populated by any structured risk factor data entered into the EMR) dated within 6 months after the implementation of the intake tool compared with observations before the implementation of the intake tool. A χ2 test was undertaken to compare the difference in proportions. The secondary outcome was an evaluation of the quality of the smoking data. This was measured by comparing the type of smoking information within the CPCSSN risk factor table before and 6 months after the intake tool was implemented. The use of a standardized intake tool is intended to harmonize the semantic distinctions of smoking data (eg, yes or no vs former, present, or never). In this way, the final outcome was an evaluation of the semantic harmonization of smoking information within the EMR across the FHT. This was measured by comparing the number of different ways that a participant’s smoking status was recorded before and after the intake tool was implemented. This outcome was measured by finding any smoking data entered into a participant’s EMR using a search algorithm that flagged any text that included words containing smok, cig, or toba. Ethics approval was obtained from the research ethics boards of all the universities that host the practice-based research networks and from the Health Canada Research Ethics Board. All physicians that contributed their data to CPCSSN provided written informed consent for the collection and analysis of their EMR data. There were 7312 patients with encounters during the 6 months after the implementation of the smoking intake tool who had also had encounters before implementation. Comparison of the before and after periods shows a significant 55.0% increase in the proportion of patients with a documented smoking status (P < .001; 95% CI 0.53 to 0.56). Before the implementation of the intake tool, 18.4% (n = 1342) of the cohort had a smoking status entered into a structured field in the EMR (Table 1); after implementation of the intake tool, 73.2% (n = 5351) of the cohort had a structured smoking status entry (Table 2 and Figure 2). Number of completed smoking status fields before implementation of the intake tool: N = 7312. Number of completed smoking status fields after implementation of the intake tool: N = 7312. After integrating the smoking tool into clinic procedures, the number of identified smokers increased by 11.9% and 1136 former smokers were identified (Table 2). For patients with only free-text smoking data, the number of different ways that smoking was recorded in the unstructured data entry field dropped from 1418 to 347 after implementation of the intake tool. Before the implementation of the intake tool there was no protocol for the routine collection of smoking status data. A patient’s smoking status was recorded in various ways, in as many as 4 different places within the EMR, in noncoded or free-text fields, and by various health professionals. In a fast-paced practice environment, this inconsistent and unreliable documentation of an individual’s smoking status makes it difficult to estimate smoking prevalence or easily identify smokers for targeted cessation advice. Additionally, in an academic environment, medical residents read patient charts and rarely have time to review the free-text fields for important information like lifestyle habits, even though this is a considerable contributor to chronic disease. Not surprisingly, this study found that including a smoking intake tool as part of the vital signs check during a primary care encounter led to a statistically significant increase in the proportion of patients with smoking information within the EMR. A large proportion (73.1%) of the participants who had no smoking information before implementation of the intake tool (n = 3687) had smoking documentation following implementation (n = 2694). This supports previous reports on the effectiveness of using education and information technology tools to increase data discipline. Juxtaposing the different risk factor smoking statuses in Table 1 with those in Table 2 shows how a screening tool for smoking can help a primary care provider ask for and document more meaningful information about this risk factor. Electronic medical record documentation that states a patient is not a smoker gives no indication whether the patient is a former smoker or has never smoked. This distinction is important for clinicians and researchers, as this difference has important implications for a patient’s risk status. Furthermore, the critical value of having a standardized method for documenting smoking status is evident in the 11.9% (867 of 7312) of participants who were newly identified as current smokers. This tool has considerable ramifications on the planning of clinical interventions and is useful to primary care researchers. Previous studies have found rates of smoking documentation improvement ranging from 10% to 60%.2,13,14 This variability might be due to patient or physician characteristics, preintervention rates, and the effectiveness of specific interventions at a particular clinic. It is likely that this study did not see smoking status documentation reach 100% owing to varying degrees of uptake by the different clinicians within the FHT. In addition, even after the implementation of the intake tool there were still 350 different (unique) ways that smoking status was entered into the EMR. This is likely owing to the 968 participants whose smoking information was not updated and their free-text documentation persisted even after the intake tool was implemented. This study shows that the implementation of an intake tool, integrated into existing clinical operational structures, is an effective way to standardize clinical documentation and promotes the optimization of EMRs. To offer the best possible care to patients, primary care providers should be fully informed about their patients’ lifestyle habits and how they affect their health. Incorporating an intake tool that can capture smoking status into the daily routine of a primary care practice can have an important clinical significance. The number of known smokers in the cohort more than tripled after the intake tool was implemented. Having this knowledge can help a primary care team manage its patient population and reduce the number of acute and chronic conditions related to smoking. A clinical data repository like CPCSSN is an ideal way to evaluate health information quality improvement initiatives. The complex algorithm developed by CPCSSN for cleaning and classifying various risk factor fields from multiple EMR systems allows a clinical practice to monitor and measure changes to data collection and input procedures and processes14; CPCSSN can provide a baseline measure of a practice’s data quality and indicate where quality improvements might be necessary. Following the implementation of a health information technology quality improvement initiative, CPCSSN can provide the evidence for the continued support of that initiative or indicate where further changes need to be implemented. This intake tool is an efficient and effective mechanism to improve the quality of smoking status documentation, which has potential health benefits for patients. However, there are several limitations that should be considered. First, the tool was only implemented at one clinic, so the results could be affected by local clinic idiosyncrasies. Second, this study used a simple before-and-after evaluation design, which might be vulnerable to internal validity threats. The observed results could be valid in the short term (6 months after intervention) but might not persist over the long term as other circumstances arise (work flow changes, staff turnover, decline in motivation to use intake tool, etc). Also, the secondary outcome was measured using a search algorithm rather than a manual chart audit. This could have caused some underestimation of the number of ways smoking was recorded before and after implementation of the intake tool. However, the search terms used were extensive and it is unlikely that many records were missed. Finally, this study did not evaluate if using an intake tool to document smoking status for patients resulted in a reduction in smoking rates. However, extensive research on the OMSC has shown that improving documentation is a key component of a successful smoking cessation program. By itself a smoking intake tool will not reduce smoking rates, but it is a key component of an effective, simple, and systematic program for helping patients quit smoking.15,16 Future research in additional clinical settings is needed to support these findings. Also, evaluating the correlations between patient and physician characteristics and EMR documentation could indicate areas for further documentation improvement.2 In addition, intake tools to assess other lifestyle habits should be pilot-tested to determine their feasibility and effectiveness in enriching current data and improving patient health outcomes. This study found that incorporating a smoking intake tool into the daily routine of a primary care practice can have an important clinical significance. The number of known smokers in the cohort more than tripled after the intake tool was implemented. Having this knowledge can help a primary care team manage its patient population and reduce the number of acute and chronic conditions related to smoking. The effectiveness of adding smoking to a patient’s vital signs check is one example of how an intake tool can be leveraged to standardize the collection and documentation of important clinical information. With a standardized EMR data entry strategy, a patient’s clinical data are accessible to all members of a primary care team, which is essential to providing comprehensive care. This research was made possible through a contribution agreement from the Public Health Agency of Canada to the College of Family Physicians of Canada. The views expressed do not necessarily represent the views of the Public Health Agency of Canada. Electronic medical records (EMRs) are integral to a primary care team’s communication. Unfortunately there is often wide variability in data content and a high level of missing data. To improve the quality of data entered into an EMR, an efficient process is essential. High-quality data are essential to managing important risk factors such as smoking at the patient and population levels. 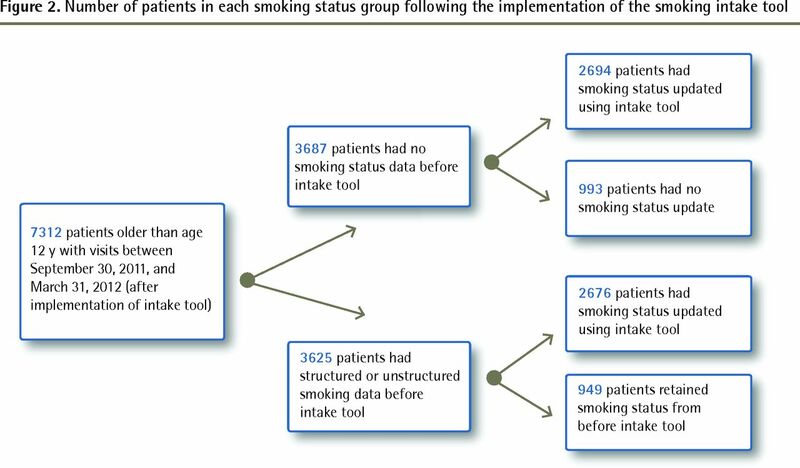 This study evaluated the transformation in smoking status documentation after implementing a standardized intake tool that was designed to improve data quality. This study found that including a smoking intake tool as part of the vital signs check during a primary care encounter led to a statistically significant increase in the proportion of patients with a documented smoking status. Intake tools to assess other lifestyle habits should be pilot-tested to determine their feasibility and effectiveness in enriching current EMR data. Le dossier médical électronique (DME) est un élément essentiel à la communication dans une équipe de soins primaires. Malheureusement, il y a souvent beaucoup de variabilité dans les données qu’il contient et il y manque beaucoup de données. Si on veut améliorer la qualité des données inscrites au DME, il est essentiel d’utiliser une méthode efficace. Pour prendre en charge des facteurs de risque aussi importants que le tabagisme, il est nécessaire d’avoir des données de grande qualité, et ce, tant au niveau du patient que de la population. Cette étude a évalué de quelle façon l’enregistrement des données a évolué après la création d’un outil d’enregistrement standardisé pour améliorer la qualité des données. Les résultats de l’étude montrent que le fait de faire mention de la consommation de tabac au moment de la prise des signes vitaux lors de la première consultation en soins primaires entraînait une augmentation significative de la proportion de patients pour lesquels on avait des données sur leurs habitudes de tabagisme. Des outils d’enregistrement pour évaluer d’autres habitudes de vie devraient être mis à l’essai afin de déterminer leur faisabilité et leur efficacité pour enrichir et tenir à jour les données du DME.
. Changing the culture: interprofessional education for collaborative patient-centered practice in Canada. J Interprof Care 2005; 19 (Suppl 1):1–4.
. Quality and correlates of medical record documentation in the ambulatory care setting. BMC Health Serv Res 2002; 2 (1):22. Epub 2002 Dec 10.
. An educational intervention to improve data recording in the management of ischaemic heart disease in primary care. J Public Health (Oxf) 2004; 26 (1):34–7.
. Trends in the use of electronic medical records [Fast Facts]. Can Fam Physician 2012; 58 :e21. Available from: www.cfp.ca/content/58/1/e21.full.pdf+html. Accessed 2015 Nov 10.
. Healthy lifestyle characteristics among adults in the United States, 2000. Arch Intern Med 2005; 165 (8):854–7. Chronic disease epidemiology and control. 2nd ed. Washington, DC: American Public Health Association; 1998.
. Reducing tobacco use: a report of the surgeon general. Atlanta, GA: Office on Smoking and Health, National Centre for Chronic Disease Prevention and Health Promotion, Centers for Disease Control and Prevention; 2000.
. Women and smoking: a report of the surgeon general. Atlanta, GA: Office on Smoking and Health, National Center for Chronic Disease Prevention and Health Promotion, Centers for Disease Control and Prevention; 2001.
. Draft pan-Canadian primary health care electronic medical record content standard, version 2.1—implementation guide. Ottawa, ON: Canadian Institute for Health Information; 2012.
. Caring for the whole practice. The future of primary care. Can Fam Physician 2013; 59 :800 (Eng), e341 (Fr).
. Systematic review of scope and quality of electronic patient record data in primary care. BMJ 2003; 326 (7398):1070.
. The potential to improve ascertainment and intervention to reduce smoking in primary care: a cross sectional survey. BMC Health Serv Res 2008; 8 :6.
. Quality of smoking data in GP computer systems in the UK. Inform Prim Care 2006; 14 (4):242–5.
. Improving usability of smoking data in EMR systems. Can Fam Physician 2013; 59 :108 (Eng), e60 (Fr).
. Strategies to increase the delivery of smoking cessation treatments in primary care settings: a systematic review and meta-analysis. Prev Med 2010; 51 (3–4):199–213. Epub 2010 Jun 17.
. Best practices for smoking cessation interventions in primary care. Can Respir J 2009; 16 (4):129–34.
. Transforming primary care: from past practice to the practice of the future. Health Aff (Millwood) 2010; 29 (5):779–84.
. EHRs in primary care practices: benefits, challenges, and successful strategies. Am J Manag Care 2012; 18 (2):e48–54.